Lab Zero's RPG, Indivisible, is one of those games that you tend to forget is being worked on—but it always cheers you up when you're reminded it's coming soon. 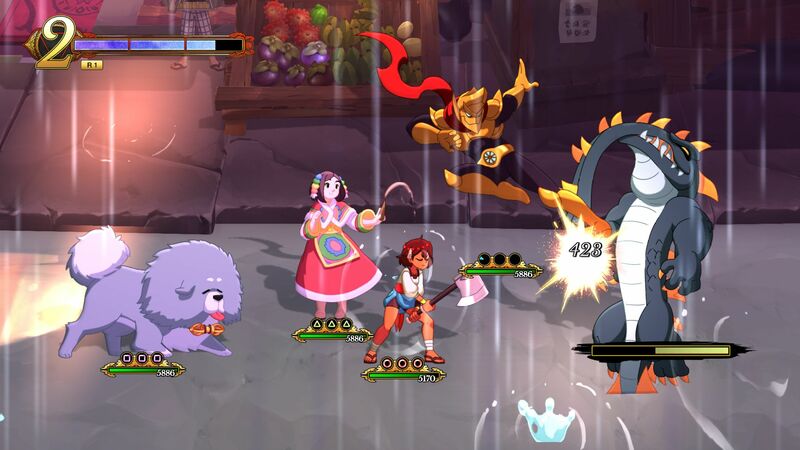 So here's your daily mood-lifter: Indivisible continues to exist, and from what I played of the demo publisher 505 Games brought to PAX East 2019, it's looking quite fine. Some of the advanced mechanics introduced through its battle system might take some getting used to, though. Indivisible has been in the works since 2015, and we were all a little bummed when we received word about it being delayed into 2019. We still don't have a specific release date, but it's clear Lab Zero is still applying ample spit and polish. The demo I played had a bug that turned a guard into a blank purple square, and it was great. Blank Purple Square Guard 2020. The stuff that really matters about Indivisible, e.g. its battle system, its character roster, and said characters' abilities, are already slotted in place. The PAX East demo emphasised fights and terrain scaling, which is done with the aid of a magic axe wielded by the game's hero, Ajna. Indivisible's battle system mixes action with traditional RPG skillsets and is overall a loving tribute to Square Enix's underrated Valkyrie Profile. It's also not the kind of battle system that lets you button-mash your way to victory, even though it does let you fling your heroes at your foes at a satisfying and steady pace. See, some enemies can be dispatched by spamming the attacks available to each character, but several armored enemies require you to perform combos and break through their shields if you hope to do more than chip damage. I admittedly had some problems performing some of these combos. You need to perform a brisk up-down-up-down motion on the analogue stick alongside your attack if you want to strip protected guards of their iron hides. I had a hard time getting the motion right with Ajna, resulting in some frustrating and drawn-out encounters. However, it's worth mentioning the demo I played really committed me to a trial by fire: Most RPGs gradually introduce you to advanced techniques, but the demo started me in medias res with a great escape from a castle prison. I bet I'll scale those guards like ugly fish when Indivisible gives me the chance to get in some practice. There's also a chance the shield-breaking mechanic will be altered before launch, as a 505 representative told me Lab Zero is tweaking it all the time. Despite my frustrations, Indivisible remains on my "Most Anticipated" list for 2019. Its graphics are wonderful and filled with unique character designs (I'm already prepared to stan Razmi, the dead-eyed shamaness who cloaks herself in a tiger skin), and its large roster has me confident I'll find a comfortable playstyle. By the end of my demo, I was already rocking a boss with an archer I'd only just recruited. Indivisible will be released on PlayStation 4, Xbox One, Switch, and PC later this year. Disclosure: USG is a ReedPop company owned and operated in conjunction with PAX. Tagged with 505 Games,	Lab Zero Games,	Opinions,	PAX East 2019,	PC,	PlayStation 4,	Role Playing Games,	Rpgs,	Switch,	Xbox One. An old classic finds a young fan to take up its mantle.